to support the United States National Soccer Teams through a unified and dedicated group of supporters. Join the community, become an American Outlaw and help us Unite & Strengthen fans of the United States National Teams, through a group of dedicated supporters. We are loud, passionate, organized and dedicated. Night before parties to meet fellow fans and get hyped for the game, tailgates to build the passion and atmosphere to bring in the stadium, the march into the stadium to show that we are here, and the supporter section to will the team to victory. See what it is all about and once you attend one, you won’t miss another. Join fellow American Outlaws for an unforgettable 2019 Women’s World Cup experience. 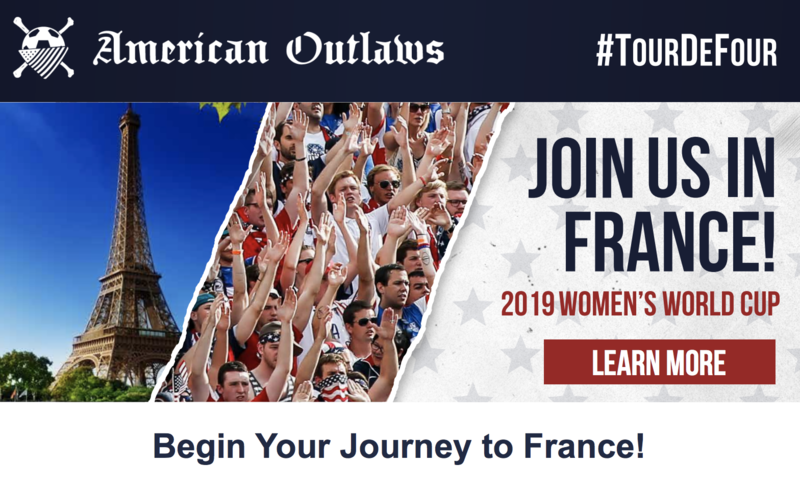 Sing, chant and celebrate the camaraderie of the game, then explore the wonders of France with travel packages exclusive to American Outlaws Members! Read about member stories, re-live games, follow cool happenings with the AO community through the Voice of AO Blog. Be apart of a local #AOFamily and help grow the movement. Unite and Stengthen your city. Hats off to the American Outlaws, they have driven it on their own. They used to come in dribs and drabs and they have banded together and created a voice.It is brilliant for us now, to see the banners and the colors. They go where we go. For us as players it gives you goose bumps. There are men and women who have decided that it means something important in their life to get behind us and get loud and supportive. That is incredibly moving to me. The main thing is just to know their mindset, that they are right there to dig in and fight with you. Soccer is a team game and that extends to them. U.S. Soccer support is going to the next level...thanks to the American Outlaws. I truly love this game and it will be in my life forever. Now, I'm looking forward to being a USWNT fan. American Outlaws, where do I sign up?"